The Gibson Les Paul Sun burst guitar from 1958 1959 1960 is the top of the electric guitar heap. Still made today, but the original 58 59 60 Sunburst models are the originals that started it all. Some have a very plain "top" (the maple wood on the top side of the guitar), and some are very "flamey" (the figure in the maple wood that is often called fiddle-back maple). The attractiveness of the wood, the playability, the sound - all these thing add up to a guitar that even today seems to be unsurpassed. Many famous players made this their standard guitar such as Jimmy Page, Eric Clapton, Mick Taylor, Duane Allman, Jeff Beck, Mike Bloomfield, Saul Hudson (aka Slash, a more modern player) and countless others. All original sunburst Les Pauls should have a two piece maple top with a center seam. Though there are some early 1958 Sunburst Les Paul examples that have off-center seam maple tops (serial numbers 8 1641, 8 3102, 8 3322). These may be Les Paul Goldtops refinished to sunburst (or I guess possibly early sunburst experiments by the factory), because adjacent serial numbers are goldtops (8 1008, 8 1151, 8 2074, 8 2795, 8 3127, 8 3305, 8 3324, 8 3823). The earliest known sunbursts are 8 3096 and 8 3087 (with 8 3087 generally thought of as "the first sunburst"), and they are logged into the Gibson ledger books on May 28 as "2 LP Spec. finish". 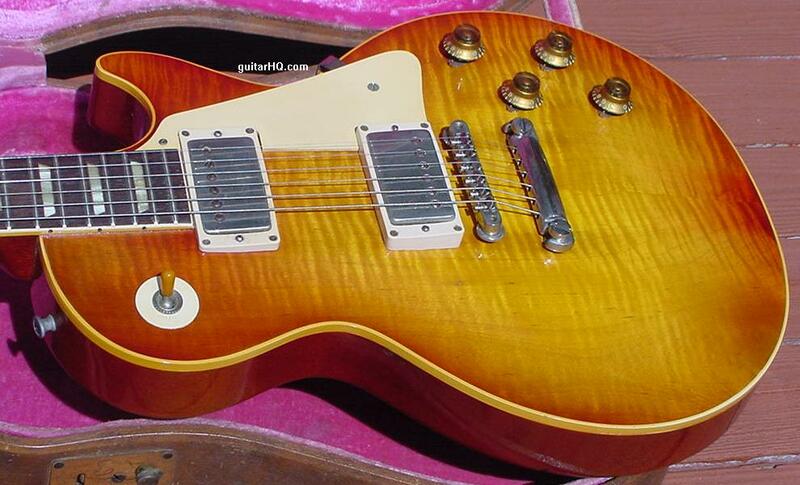 Also 8 1641 was the first listing in the Gibson ledger books February 25, 1958 and was listed as "LP cherry red sunburst". Remember more than half of the 1958 Les Pauls made were goldtops (since the sunburst began in July 1958) The earliest verifiable Les Pauls with original sunburst finish are 8 3087 (with no visible center seam) and 8 3096 as both are marked in the Gibson ledger books as "2 LP Spec finish". By July 1958, Gibson has replaced the gold top finish on the Les Paul with a cherry red sunburst finish. A cosmetic result of replacing the gold top was the grain of the maple top was now clearly visible. One of the peculiarities of the maple used was that some maple had flamed/figured patterns that ran across the grain. This could give a 3-dimensional look to the maple that is often called "figure" or "flame". These "tiger stripe" patterns can be very beautiful. Back in 1958 it was just pot luck as to how figured the maple top was on any particular Les Paul. Probably only 20% of all Les Paul Sunburst guitars from 1958 to 1960 had any significant maple figuring. 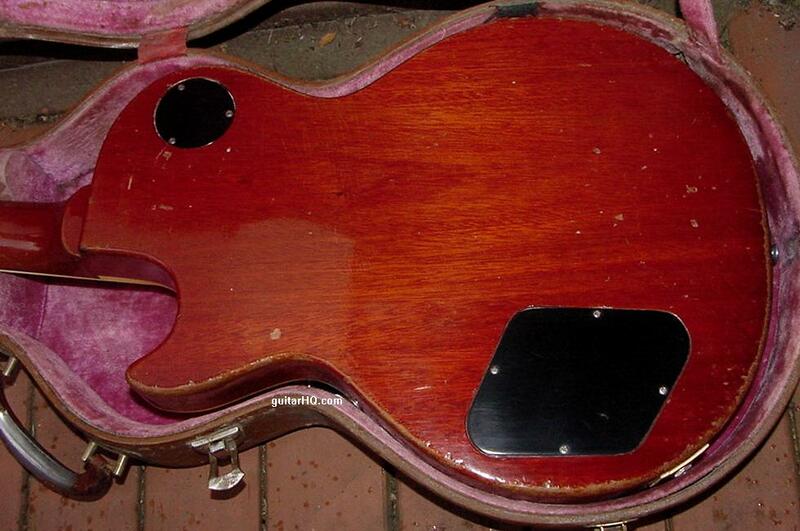 Many of Gibson's 1958 to early 1960 red Sunbursts were sprayed with an ultra-violet sensitive dye. With exposure to sunlight, the red often faded making the "sunburst" an "unburst", giving the Les Paul's top a uniform yellowish-brown color. Hence the reason why 1958 to 1960 Gibson Les Paul Sunburst guitars can now be seen in a variety shades of sunbursts. The extent to which the Sunburst faded depended not just upon how much UV exposure they'd had but also when they were made. The models from 1959 to mid-1960 tend to have the red dye that fades the most. Late 1960 Les Paul Sunburst models were finished with a red dye that was more impervious to fading and are often still a bright cherry red sunburst. 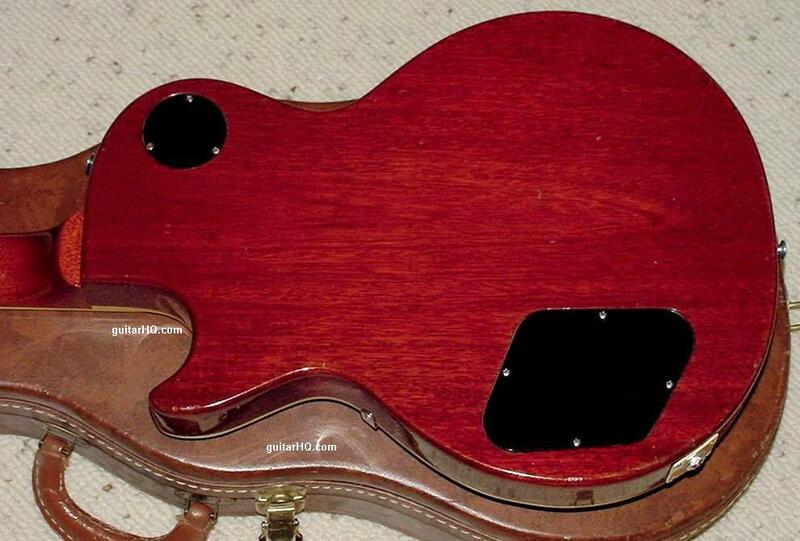 This finish often has a more "tomato soup" type of red to it, which I personally find less cosmetically appealing. The 1958 Sunburst Les Pauls also seem to fade a bit less than the 1959 to early 1960 models. The Les Paul Sunbursts went through a few minor changes during 1958 to 1960. 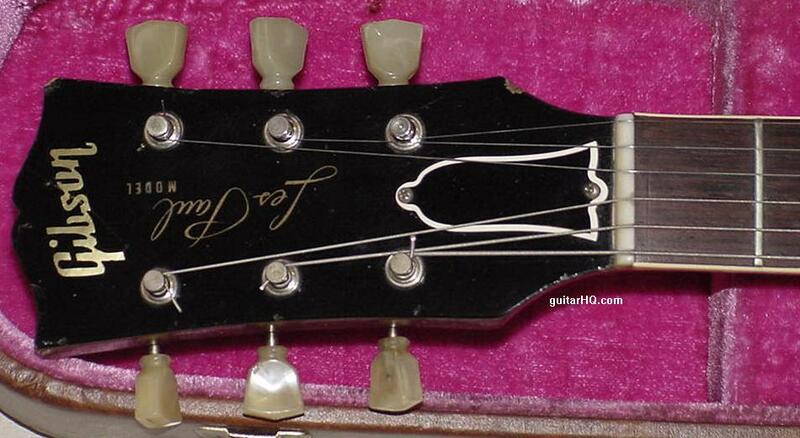 The fretwire used was changed to a wider type in early 1959, around serial number "9 0400". Also the neck shape was altered to make the neck less clubby. 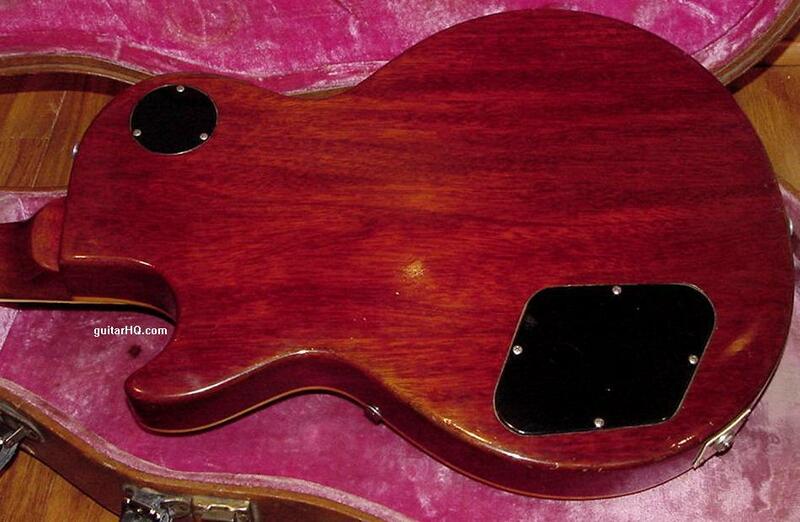 By mid-1960 the neck profile was reduced even more to a very flat profile (and less desirable in my opinion). This change was progressive, starting around "0 0700" with a slightly less clubby neck. By "0 2000" the neck is just a bit thinner, but still fairly meaty. By "0 7000" the neck had gotten a rather thin backshape. In late 1958 the jack plate and R/T ring plastics changed. From 1952 to 1958 the jack plate had more squared corners. By mid-1959 this changed to more rounded corners (a small detail but worth mentioning). Also around this period the Rhytm/Treble ring plastic switch plate changed too, with the font slightly different (thinner, more stylized) than the earlier 1953 to 1958 block lettering style. Also the plastic itself is just a touch thinner on the 1959 "poker chip" R/T ring. Les Pauls from late-1955 and onward were fitted with the standard tune-o-matic bridge and seperate stop tailpiece. But a few (perhaps around 10%) came with an optional Bigsby B7 vibrato instead of a stop tailpiece. This was a rather clunky vibrato, nowhere near as efficent as the tremolo on the Fender Stratocaster. Hence today Les Paul Sunburst guitars with the Bigsby vibrato installed (or previously installed, leaving holes in the top) tend to sell for less today than their stop tailpiece equivalents. Removing a Bigsby vibrato does however leave holes in the wood so once a Bigsby was installed, there was no way to make the holes disappear. The toggle switch route changed in last 1957, and again in mid-1958, with the move from goldtop to sunburst. The goldtop 1958 models have a "stairstep" in the toggle switch route, where most 1958 sunbursts do not. Though interestingly sunburst 8 3087 does have the stairstep toggle switch route, but others in the 8 55xx range do not. So if there was confusion on a refinished 1958 model as to it being goldtop or sunburst, this information may help. Ironically the Les Pauls of the late 1950s were not really all that popular at the time. Gibson only made about 1700 Sunburst Les Paul between 1958 and 1960. The reason for this was the humbucking pickups and solid mahagony body with maple top produced lots of sustain and a mellow tone. This was good for jazz player, except jazz player tended to use archtop electric/acoustics, not solid body guitars. Yet the Les Paul's smaller and solid body might have appeal to rock and roll players, except the rock and roll guitar sound (and country sound) of the 1950s was brighter (for which a Fender Strat or Tele would be better). So the Les Paul Sunburst had few fans during the 1950s. It wasn't until the British blues/rock invasion of the mid/late 1960s that suddenly the Les Paul became popular. Since the late 1970s, Gibson has made many reissue Les Paul Standards which look very much like the original 1958, 1959, 1960 Les Paul Standard model. So how do you tell the difference? 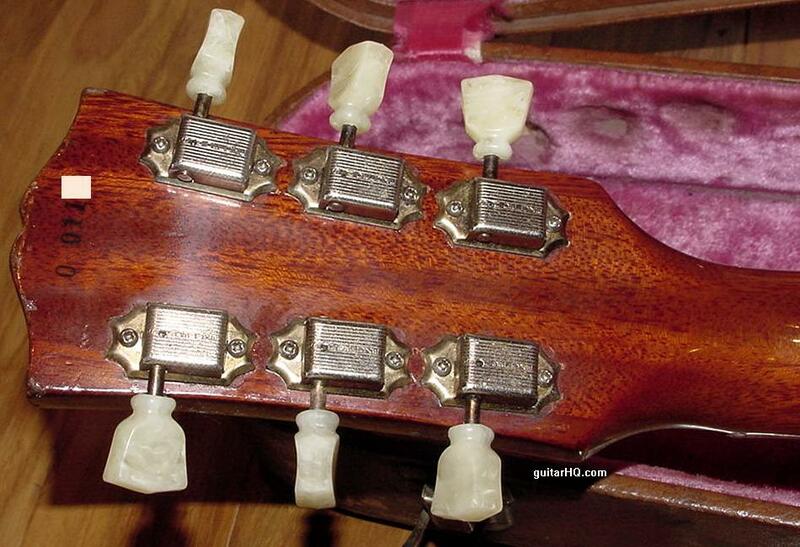 One easy way is by the positioning of the stop tailpiece. Gibson has never gotten this right on any of their reissue Les Pauls. 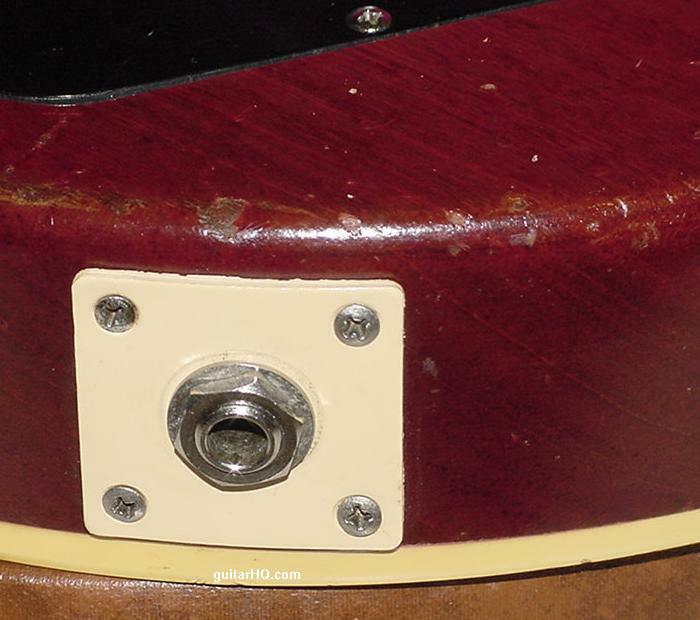 On a 1956 to 1960 Les Paul with a stop tailpiece, if you run an imaginary line from the center of the Low-E tailpiece stud through the center of the High-E tailpiece stud and continue that line, the line will touch the north edge of the Neck volume knob and the south edge of the Bridge volume knob. On reissues the line through the center of the tailpiece studs runs right into the Neck volume knob (the line is no where near the Bridge volume knob). to the volume knobs on an original 1956-1960 Les Paul. Other things that easily tell a reissue from a real 1950s Les Paul are the fingerboard inlays. 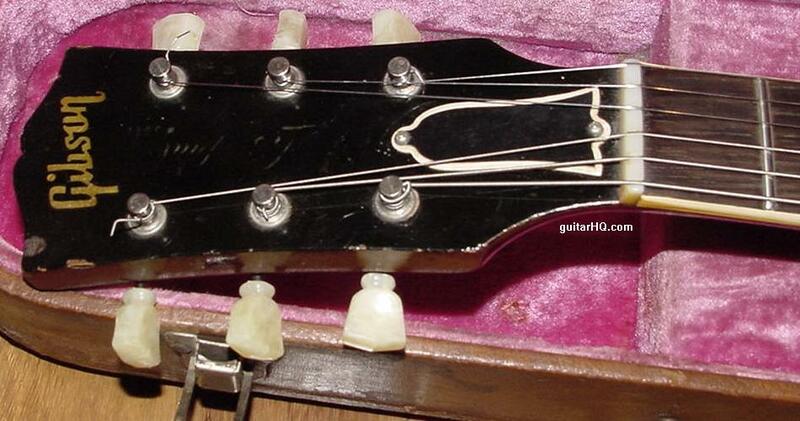 The celluloid Gibson used during the 1950s has a considerably different look than today's inlays. Celluloid is like wood, every "batch" or block is different. So there really is no way to get today's celluloid to look like the 1950s inlays. 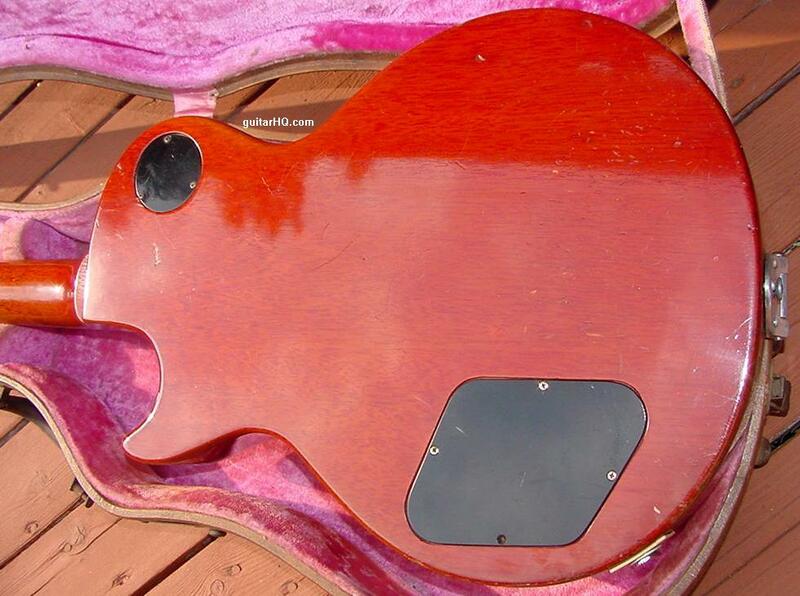 The best someone could do is to steal the inlays from a 1950s Gibson CF-100 and transplant them into a reissue. See the 1952 to 1955 Gibson Les Paul Goldtop. See the 1955 to 1958 Gibson Les Paul Goldtop. If you need to figure out the exact year of your Gibson Les Paul Sunburst, use the Serial Number. See the Gibson Serial Number Info web page for help determining the exact year. Sunburst finish replaces Goldtop finish in the fall of 1958, around serial numbers in the "8 5300" range (though some of the first known Sunburst Les Pauls like serial number "8 3096", "8 3087, "8 3322"). The maple top on a 1958 to 1960 Sunburst Les Paul is always two pieces and "center seamed" (there is basically no or little exception to this rule, except for one of the first 1958 sunburst Les Pauls with serial number "8 3322"; Generally speaking if a Sunburst Les Paul does not have a two piece center seamed maple top, it is a refinished Goldtop). Sunburst Les Pauls have a cherry red back, and black serial numbers. The color of most 1958 sunburst Les Pauls is more "red" than later 1959 models. Some (about 15%) Sunburst Les Pauls have very nice "flame" or "tiger stripped" maple tops. 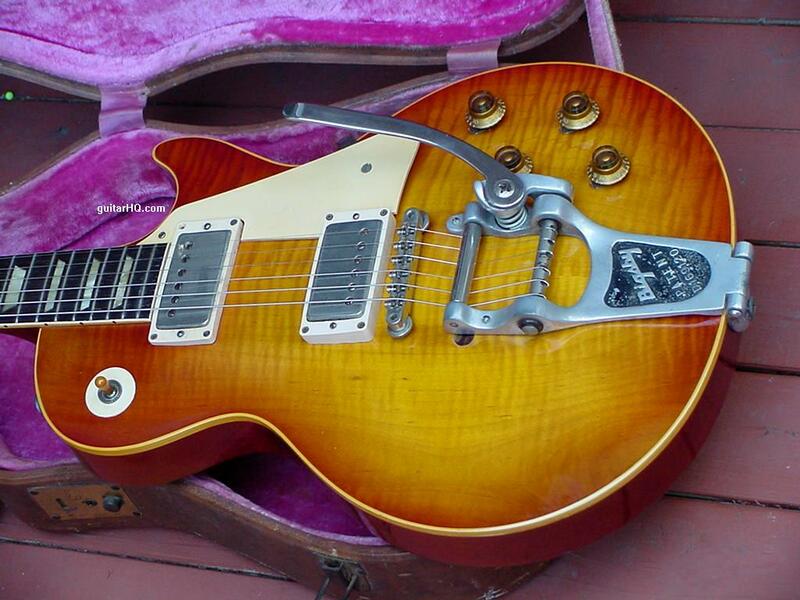 About as many as 15% of all 1958 to 1960 sunburst Les Paul Standards came from the factory with a Bigsby B-7 vibrato tailpiece (unfortunately a Bigsby sunburst Les Paul is worth less than an original stop tailpiece model). 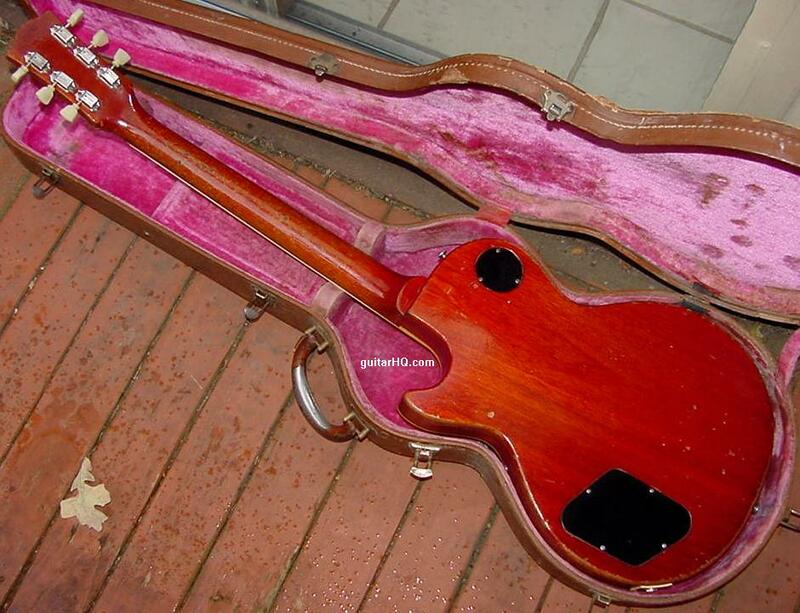 Most 1958 Sunburst Les Pauls came with a brown "california girl" case with a pink lining and four case latches. 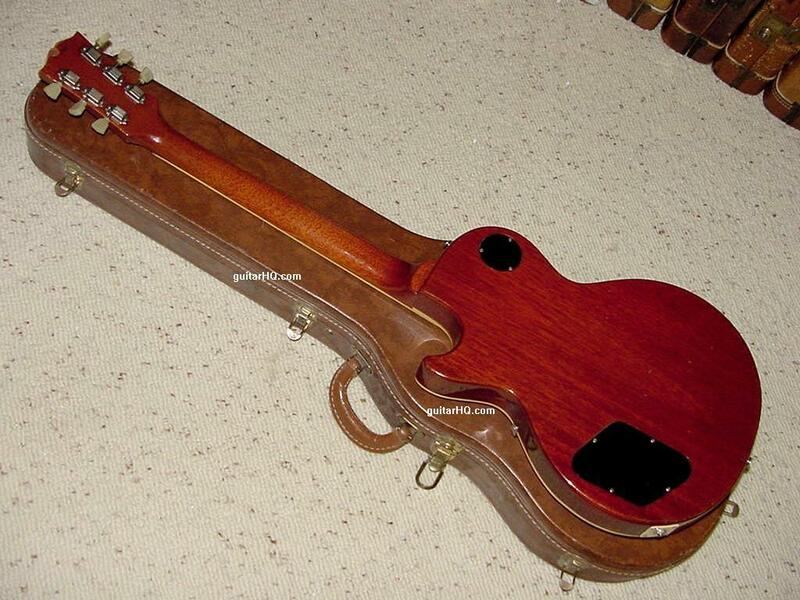 But by the end of 1958 the cases changed slightly to have five latches, and this 5-latch brown case is known as the defacto-standard Sunburst Les Paul case. 1958 Les Paul sunburst serial numbers stop around the "8 88xx" range. Frets increase in width in the serial number range "9 0300" to "9 06xx". 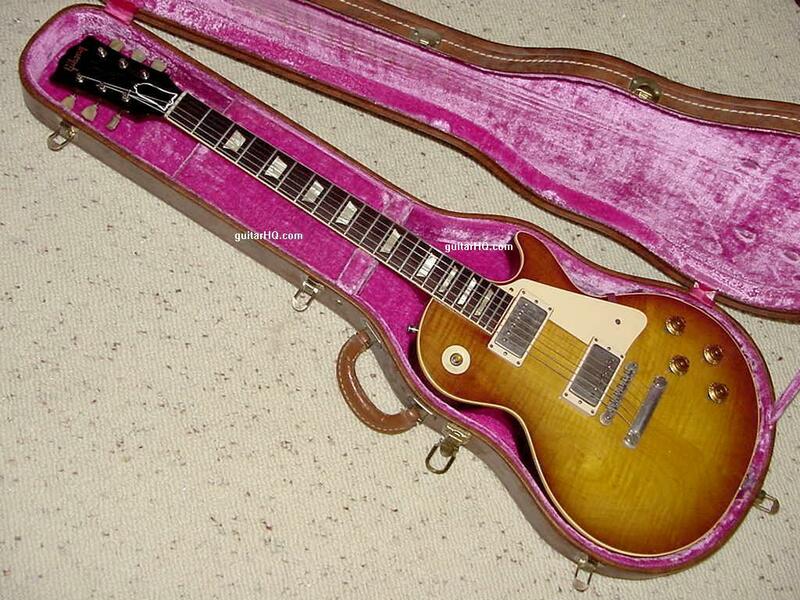 For example, low "9 0300" range serial number Les Paul sunbursts have been seen with original large frets. 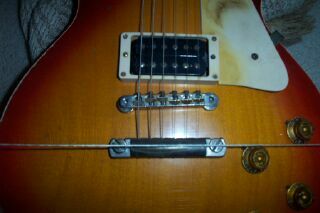 Yet some low "9 06xx" range serial number sunbursts have been seen with original small frets. In mid-1959 the jack plate changed. From 1952 to 1959 the jack plate had rounded corners. By mid-1959 this changed to more squared corners (a small detail but worth mentioning). Also around the 9 06xx period the Rhytm/Treble ring plastic switch plate changed too, becoming thinner and the font slightly different than the earlier 1953 to 1959 style. In regards to the color of the sunburst on 1959 Les Pauls, the red especially is extremely photo reactive. This means the red in the finish fades quite easily (typically fades more than the 1958 models and mid to late 1960 models). The color can completely disappear to a "honey color" or even to a yellowish green hue, with no hint of the guitar ever being cherry sunburst (unless the pickguard is removed, exposing that area of the guitar's top that is not readily exposed to light). Interestingly, a few 1959 Les Pauls have a "tobacco" sunburst finish (this color is not as desirable as the regular 1959 sunburst finish, and can have either a red or brown back). Neck dimensions of the 1959 Les Paul are considered by most as "perfect"; slightly less clubby than the 1958 models, but still "big". Also around serial number "9 06xx" another very subtle change happened; the plastic humbucker pickup bobbins changed from black to a white color. Not all pickups had this coloring, and some pickups were "zebra" (one bobbin white, one black, with the black bobbin *always* being the bobbin with the adjustable poles). 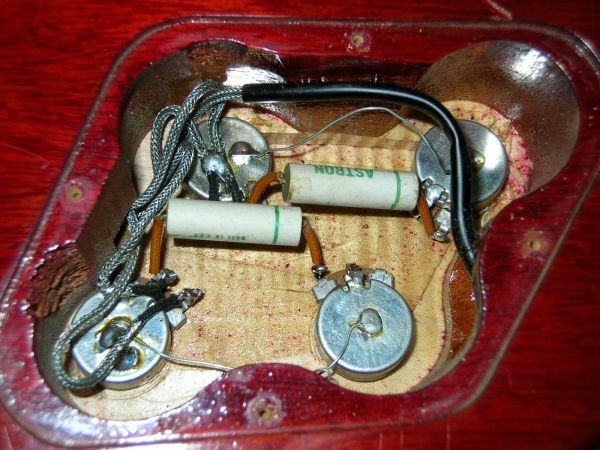 This change is really subtle, as the color of the pickup bobbins can not be seen unless the pickup covers are removed (or the bobbin mounting screws are removed from the back side of the pickup). 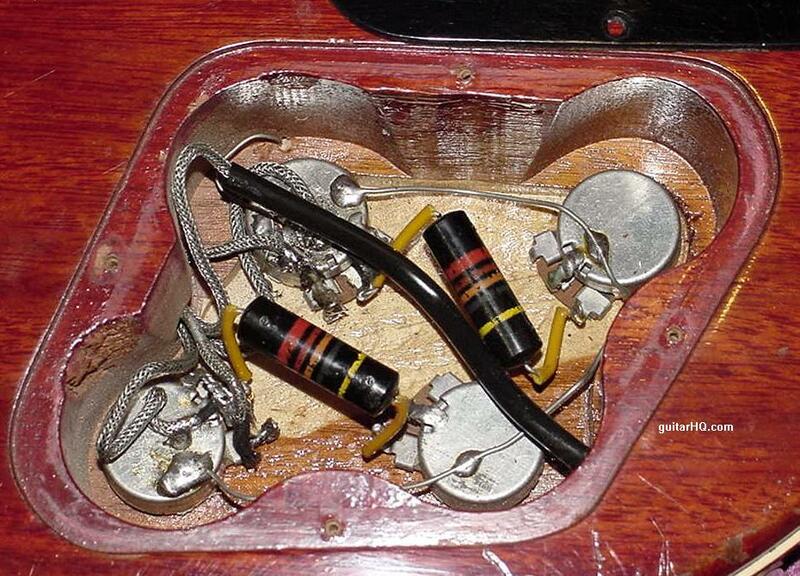 By serial number "9 1000", most 1959 Les Paul will have at least one pickup with white bobbin(s). 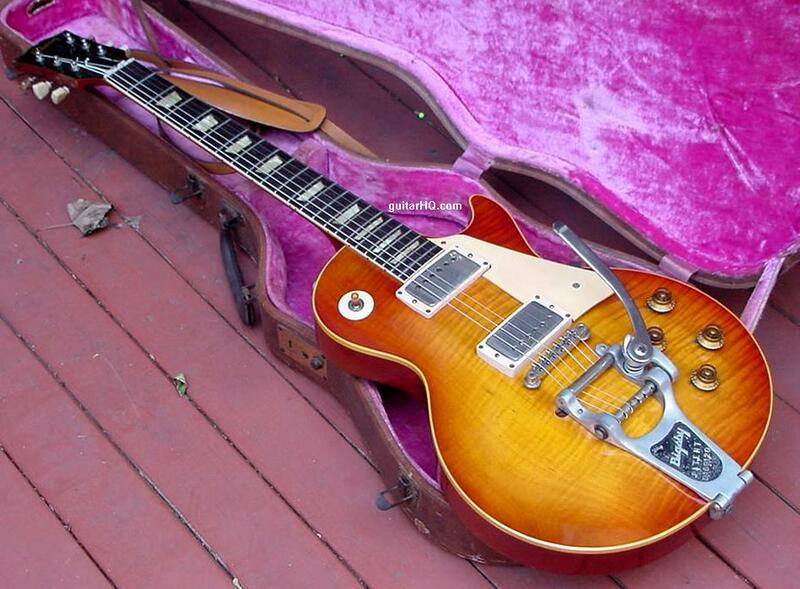 Note sunburst Les Paul serial numbers seem to stop around "9 32xx" in 1959. Early 1960 sunburst Les Pauls are identical to their 1959 cousins, but change was coming. By around serial numbers in the "0 0700" range, the neck contour starts to have a slightly thinner back shape (though this change didn't take full affect until much later in the year). Around serial numbers in the "0 2200" range, the sunburst finish changed too. The easily faded 1959 cherry red sunburst morphed to a "tomato soup" or "tangerine" red sunburst, which was much less sensitive to sun fading. The change to the tomato soup red sunburst was not fully made until around serial numbers in the "0 7xxx" range though (note there is HUGE gap in serial numbers from "0 3200" to "0 6999" there were essential no sunburst Les Pauls made). By this time, all 1960 sunburst Les Pauls have the tomato soup or tangerine sunburst finish. Also at the same time, "reflector" knobs (those with metal top caps) replace the "bonnet" knobs (those with clear tops) around serial number "0 7000". Finally, white bobbin humbucker pickups also ended about this time. The tuner keystone buttons has changed in 1960 to have two rings. Very late 1960 sunburst Les Pauls (0 8000 range) have a wider peghead too (not as wide as a double cutaway SG/Les Paul, but getting to that point). The last 1960 sunburst Les Paul serial number known is "011495" (another late 1960 Gibson Sunburst Les Paul is "010838"). Sunburst Les Pauls with a tomato soup or tangerine sunburst finish, reflector knobs, and a thin neck shape are not nearly as desirable as their 1958 to mid-1960 cousins. There is another large serial number gap for Les Paul sunbursts in 1960 after "0 77xx", with few examples showing up with later serial numbers. 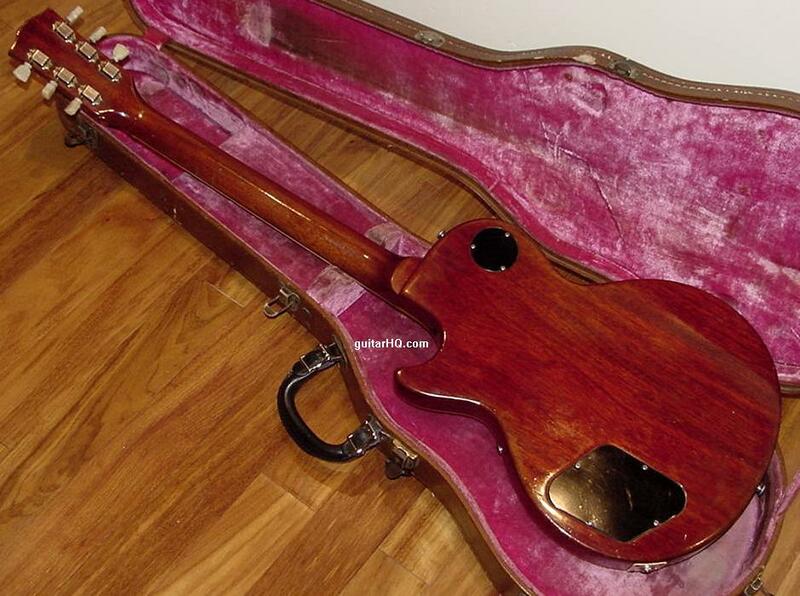 complete body style change to symmetrical pointed double cutaways, thin mahogany body with beveled edges, cherry red finish (refered to as the "SG" body style). Still says "Les Paul" on the peghead and/or truss rod cover, but is often called a "SG/Les Paul Standard" because of the SG body shape. Peghead slightly wider. This model actually started in very late 1960, at about serial number "010001" (and was co-produced with the single cutaway sunburst Les Paul). 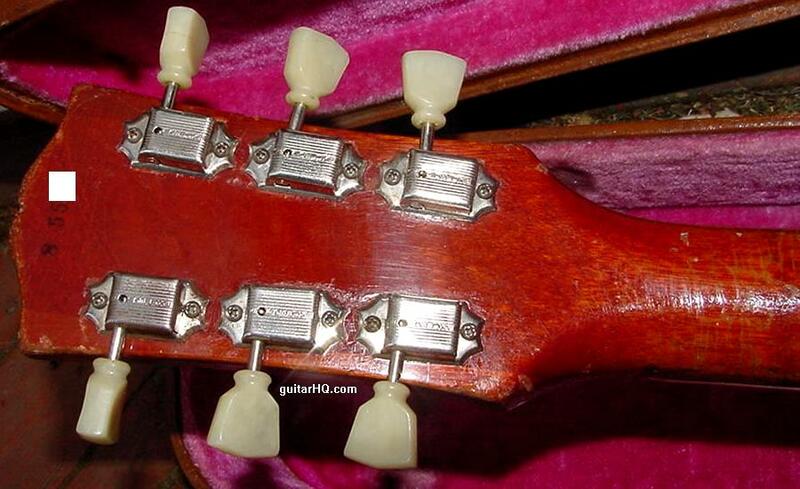 All 1960/1961 SG Standards seem to be equipped with the infamous (crappy) "sideways" vibrato. 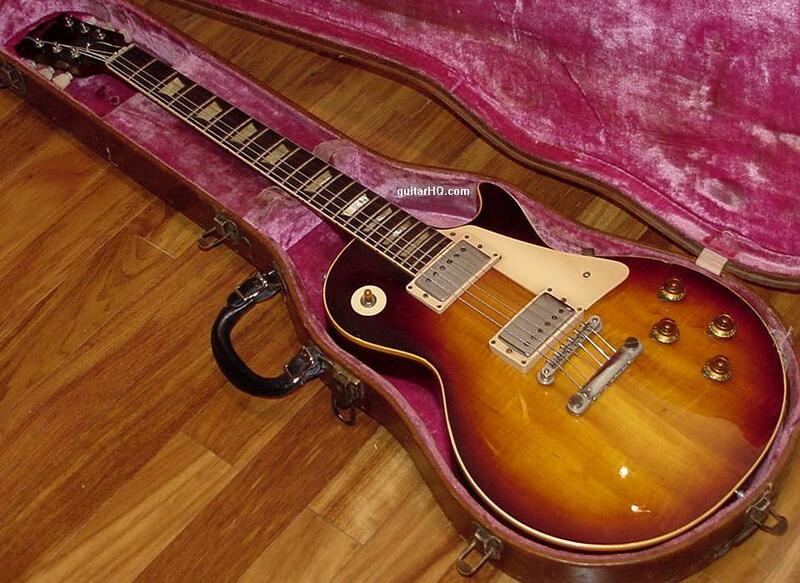 A late 1958 Gibson Les Paul Sunburst, all original. Most of the red in the sunburst finish is faded . 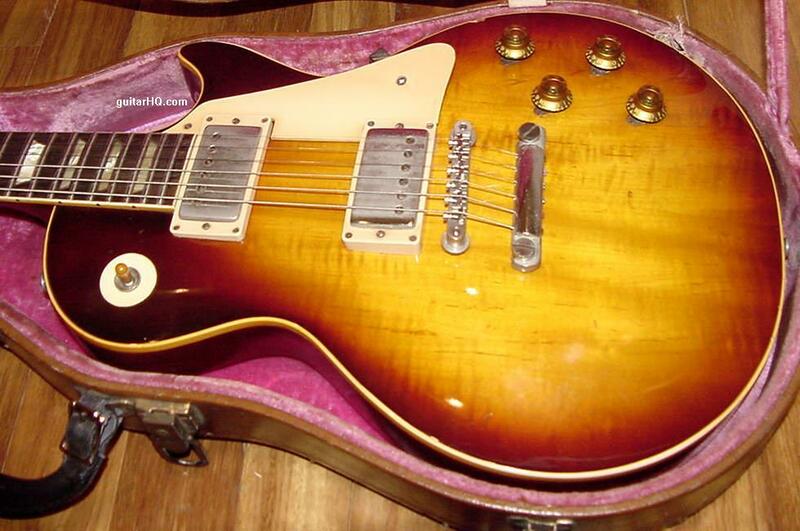 An early 1959 Gibson Les Paul Standard Sunburst guitar and original hardshell case. old Gibson guitar picks cut to cover the inserts! I suspect this was a dealer installed unit. The red in this sunburst finish is fading to a rust color, but is still quite vibrant. figure in the maple, giving the guitar a very nice visual effect. Here's the top of the guitar with the Bigsby removed. 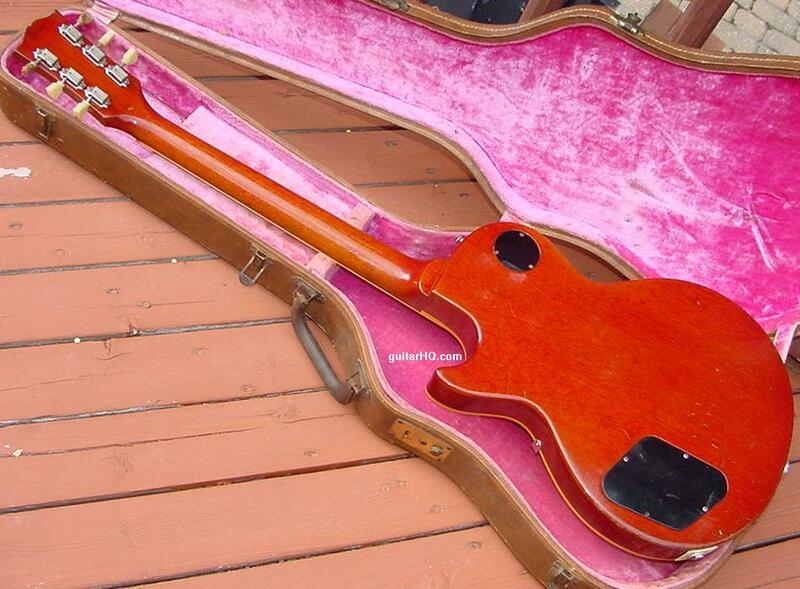 An early 1960 Gibson Les Paul Standard Sunburst guitar and original hardshell case. ES-335 style tobacco sunburst on a few Les Paul Standards in 1959 and early 1960. 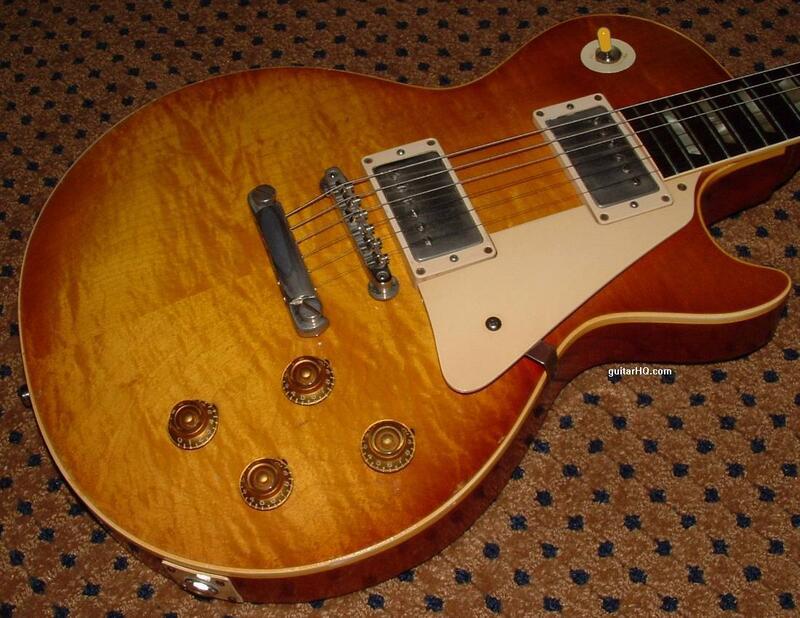 This 1960 Gibson Les Paul Standard has all the features of the 1959 models. 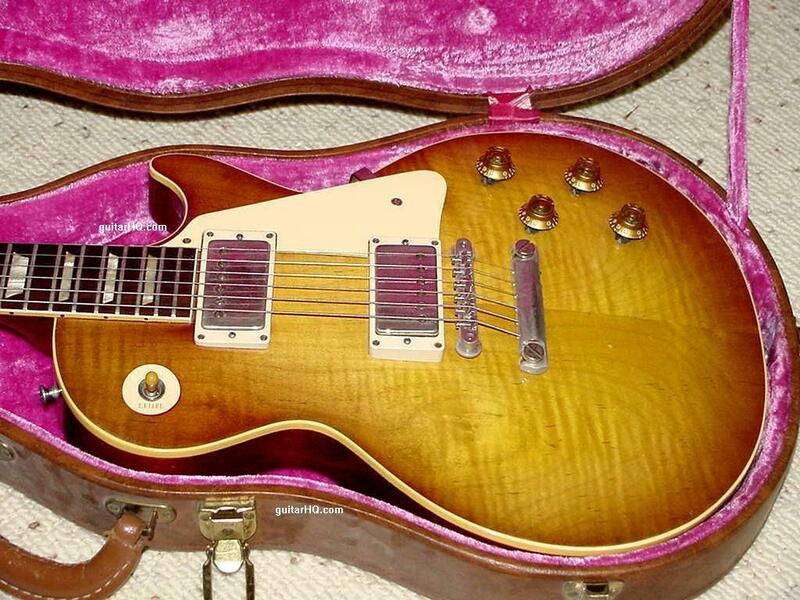 An spring 1960 Gibson Les Paul Standard Sunburst guitar and original hardshell case. 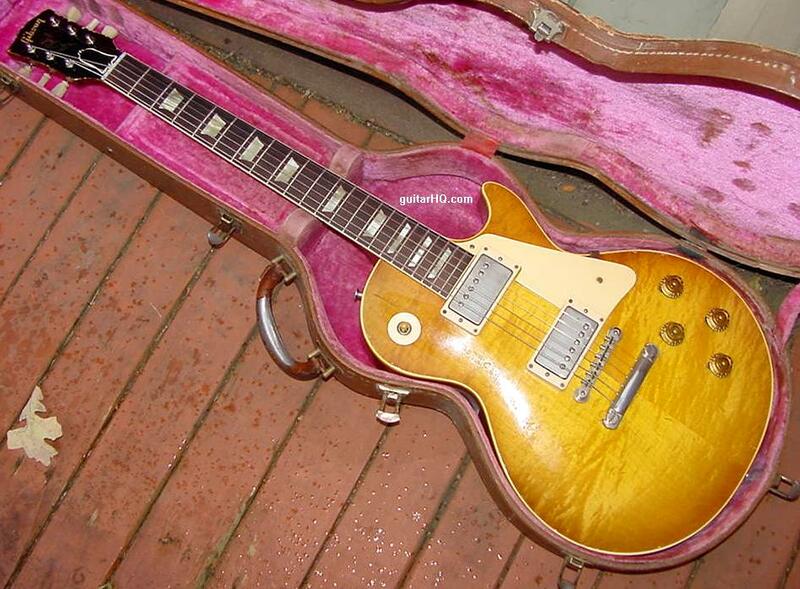 This early 1960 Gibson Les Paul Standard has all the features of the 1959 models. Notice the Astron brand of tone capacitors instead the black Spraque "bumble bees". have shrunk over time. This is very typical and something not easily reproduced. 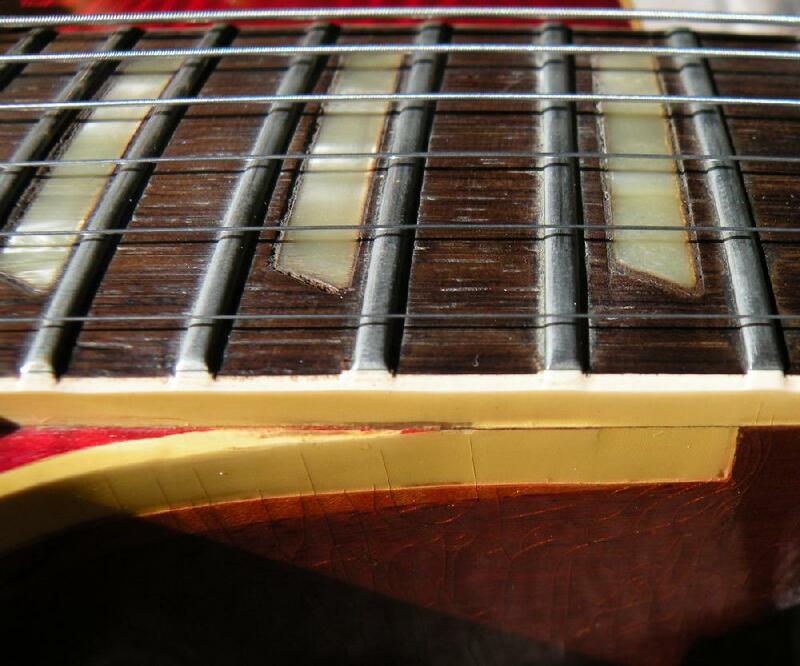 Also shown are the original fret binding "nibs" on the sides of the frets. These go away after a refret, so it's another thing to look for on originals. it can show if a 1958 goldtop was re-finished to a sunburst.